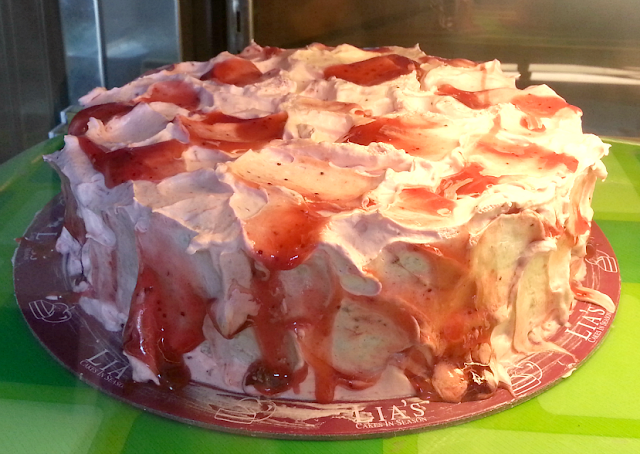 I wish I could say that I could go a day without a sugar fix but sadly, that's not the case. I think I've already established the fact that a meal won't be complete without sweets/desserts. 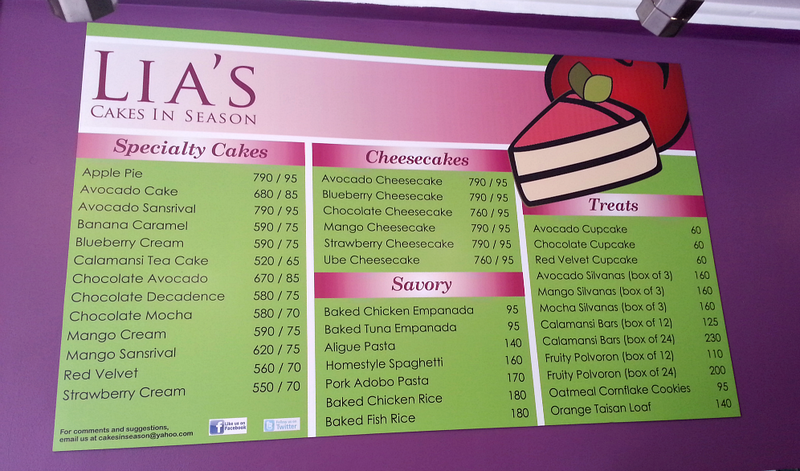 So after a hearty lunch somewhere in Kapitolyo, we stumbled upon Lia's Cakes in Season and decided this will be our destination for desserts that day. We went there around 11 in the morning so the place was practically empty, except for one customer who just bought a cake and left. The place felt casual but is a bit small, with only 2 long tables (6 square tables assembled into 2 long ones) and can accommodate 10-12 people. Probably less because 12 people would feel cramped in this little space. 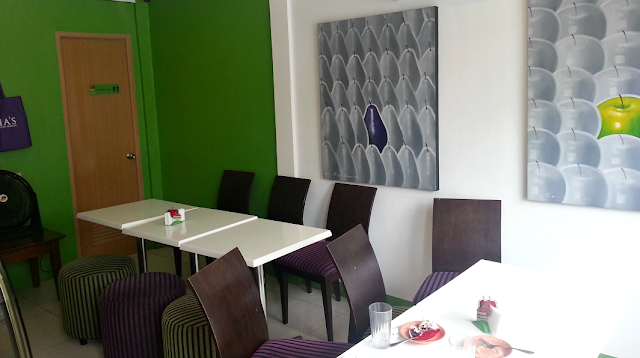 But the ambiance was okay, walls were painted with their trademark green and violet colors. Upon knowledge that they have cupcakes, I immediately asked the staff which one was their bestseller. 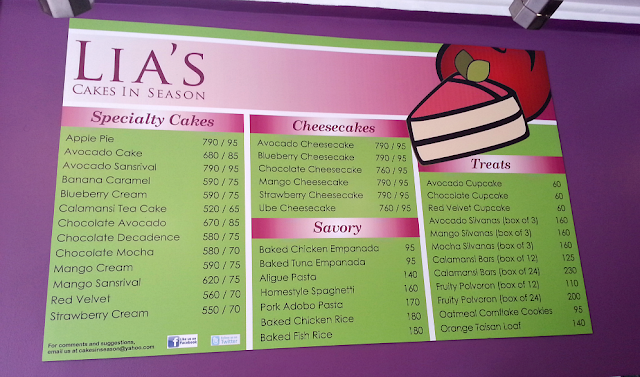 Apparently, Lia's is best known for their avocado flavored desserts. I could not resist trying one! 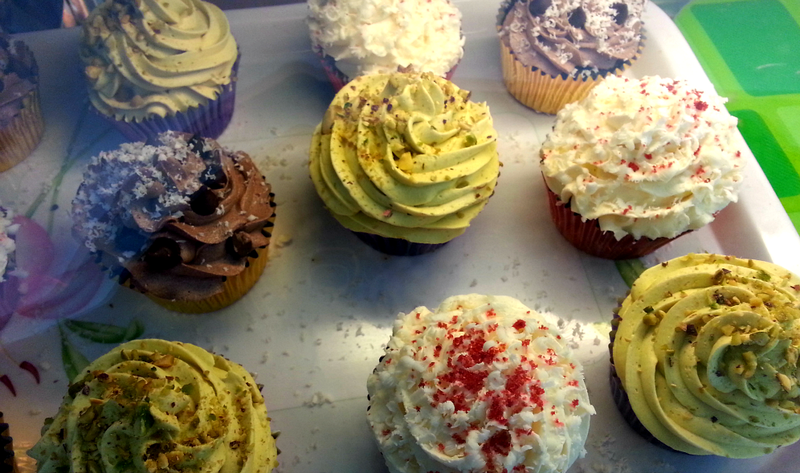 I had their Avocado Cupcake and my friend, Ian, had a Red Velvet Cupcake (we have this mission of tasting all red velvet cupcakes in town and ranking which is the best). I was really delighted by this cupcake because well, it's nothing I've ever tasted before. The cupcake base was light, not that moist but certainly not dry either. The frosting was, I think, avocado flavored buttercream. It was not too sweet and had the right avocado taste to it -- creamy, fruity and fresh. 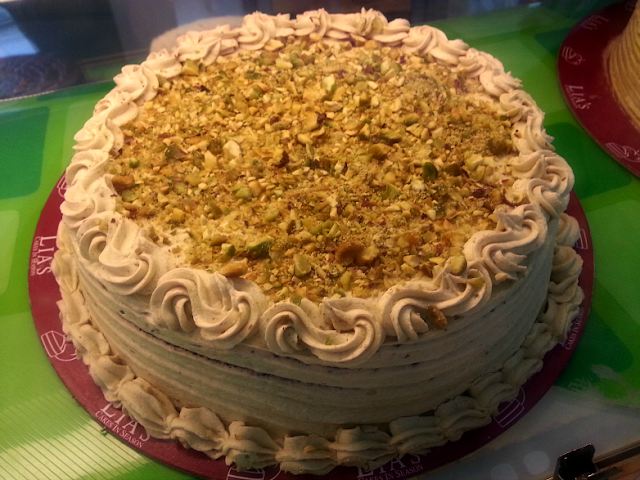 There's a sprinkle of chopped pistachio nuts at the top, too, for that added texture and nutty flavor. 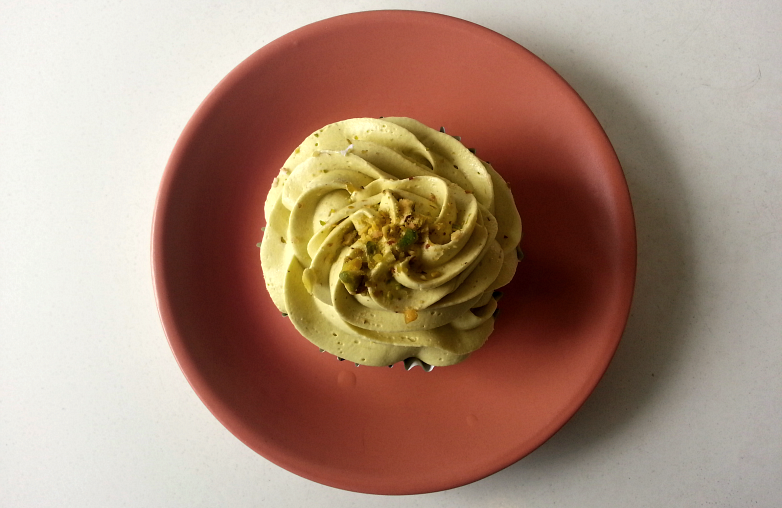 Lia's Avocado Cupcake certainly did not disappoint. But the Red Velvet Cupcake was another story. Ian thinks it needs major improvement. Most red velvet cupcakes have cream cheese frosting but Lia's version had buttercream, too, which unfortunately, didn't really work, and that somehow made all the difference. We would definitely come back to try their other offerings. I am especially curious about their Mango Specialty Cakes because mango is my favorite fruit and I would love to have a taste of their take on mango flavored desserts. Ube Cheesecake is also very intriguing. Definitely will try that the next time! Also, their staff were really nice and accommodating! We went back to Lia's yesterday and we're able to try more of their avocado treats! Lia's Cakes in Season certainly wouldn't be headlining their Avocado Cake as their bestseller if it wasn't by any means perfect. Their Avocado Cake certainly have the bragging rights because it was such a delicious treat. 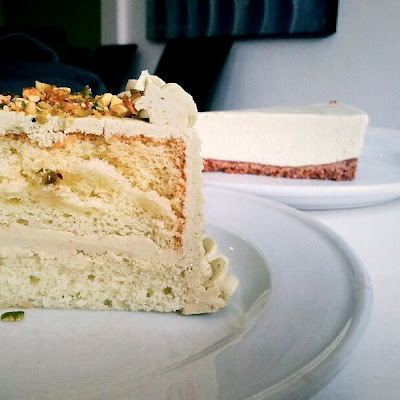 Soft chiffon cake paired with the nutty and refreshing taste that is exclusive to avocado. It was really, really good. I loved how the avocado icing's texture was melt-in-your-mouth. Another unexpected discovery was how GREAT their Avocado Cheesecake was. It was soooo good. I'm running out of adjectives to better describe the taste. Hahaha. The flavors do not overlap each other, you know that it is avocado but then the flavors transition to the salty-sourness of cheesecake, all enveloped in a thick but soft mixture on top of (also) a yummy pie crust. It was indeed a surprise to find something so good like this! I highly recommend all their avocado-flavored products.